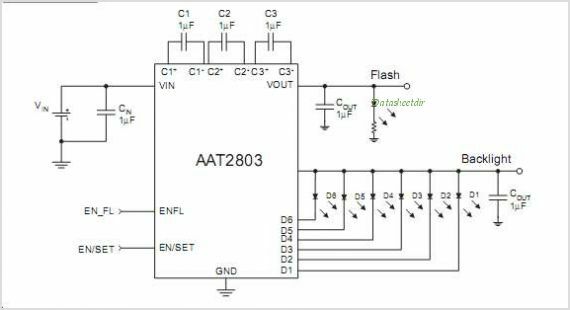 The AAT2803 is a dual Charge Pump designed to support both white LED backlight and Flash applications for systems operating with lithium-ion/polymer batteries. The backlight Charge Pump is capable of driving up to six LEDs at a total of 180mA. The current sinks may be operated in group or in parallel for driving higher current LEDs To maximize power efficiency, the Charge Pump operates in 1X, 1.5X, or 2X mode, where the mode of operation is automatically selected by comparing the forward voltage of each LED with the input voltage. AnalogicTech's AS2Cwire(Advanced Simple Serial Control) serial digital input is used to enable, disable, and set current for each LED with a 16-level logarithmic scale plus four low-current settings down to 50A for optimized efficiency, with a low housekeeping current of only 50A.The Flash Charge Pump is a Charge Pump doubler with a regulated output voltage. It is designed to deliver 120mA of continuous current and up to 300mA of pulsed current. It has an independent enable pin for improved power savings.The AAT2803 is equipped with built-in short-circuit protection and auto-disable for load short-circuit condition. Built-in soft-start circuitry prevents excessive inrush current during start-up. A low-current shutdown feature disconnects the load from VIN and reduces quiescent current to less than 1A. The AAT2803 is available in a Pb-free, space-saving, thermally enhanced 24-pin 4x4mm QFN package and is rated over the -40C to +85C temperature range. This is one package pinout of AAT2803,If you need more pinouts please download AAT2803's pdf datasheet. 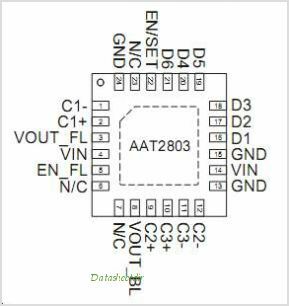 This is one application circuit of AAT2803,If you need more circuits,please download AAT2803's pdf datasheet.